The Kartemquin Collective worked to produce media that was "from the people, to the people." They brought multiple skills, talent, and experience to this endeavor, and worked together for several years in the 1970s making collaboratively-produced documentaries in a diverse variety of styles. 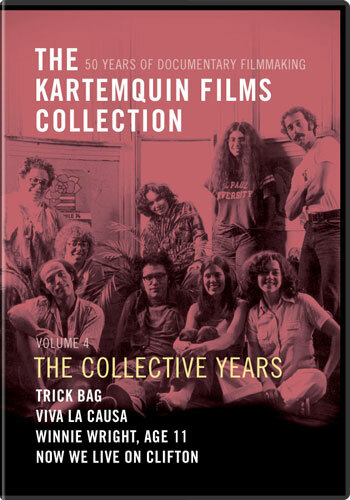 The Kartemquin Collection Volume 4: The Collective Years presents four classic short films produced in that era. All four films included are released on DVD for the first time, in digitization of original 16mm prints newly restored through a grant from the National Film Preservation Fund. Extra features include a new video of a rare reunion of the the living collective members, new videos of Winnie Wright and Pam and Roxanne Taylor reflecting upon their experience of being in the films; and several archival photos and documents from the era, along with a 'Where are they now?' update on the Kartemquin collective. Members of the Kartemquin Collective: Gordon Quinn, Jerry Blumenthal, Suzanne Davenport, Jenny Rohrer, Sharon Karp, Betsy Martens, Peter Kuttner, Judy Hoffman, Teena Webb, Richard Schmiechen, Vicki Cooper, Alphonse Blumenthal, Greg Grieco, and Susan Delson. - Video: The Collective Reunion - Video: Winnie Wright, Age 51 - Video: Now We Work on Clifton - Photographs from the Collective Years - Documents From the Collective Years - Where Are They Now?